Soundcloud is one of the most famously used online music streaming websites. Thousands of songs are uploaded into SoundCloud per day and also lakhs of minutes audio is also streamed using SoundCloud. Thus making it one of the most used audio streamer worldwide. Nowadays many artists are very much interested to add their music in SoundCloud platform. Even the SoundCloud offers you to host your song and release it exactly at the time you want. Thus SoundCloud site makes it easy for you to promote your songs online to a very large music community at free of cost. The best part is that you can also connect your social media accounts like Facebook, Twitter and some other networks that you are fond of. Thus SoundCloud allows you to upload your own songs or albums online and it promotes it to all music fans. It helps you to create your own fan base at free of cost. Also, it helps to create your own set of a playlist with a set of your favourite songs. You can maintain as many playlists as you need. Ok, now comes the tricky part. What if you need to download and save the songs from SoundCloud to hear later while you are offline? Does SoundCloud provide a way to do so? As of today, the answer is no. Don’t worry. Still, it allows us to do download the songs using their CDN. Yes, SoundCloud songs can be downloaded easily from the CDN network. But it will be little difficult to do manually. We can simply use some tools to do that work for you. These are two types of Soundcloud song downloaders we have seen. One set of people download their favourite songs separate. Song people like to download the entire playlist. 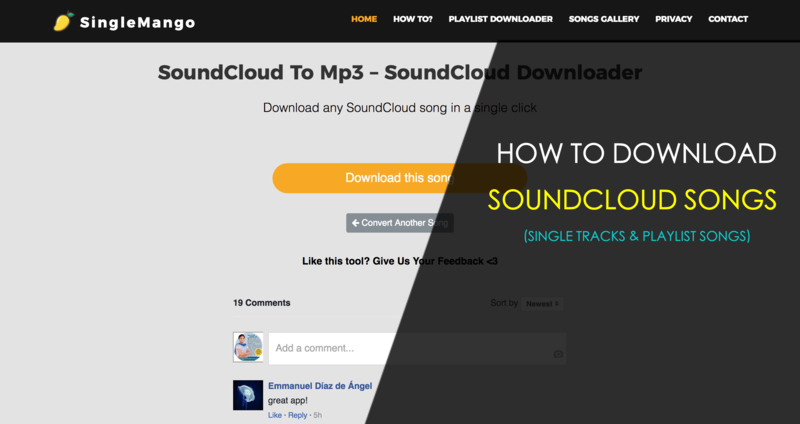 Here we will show you how to download SoundCloud songs of both types. We have tested some of the available downloading tools by using them to download our favourite songs. We have found many of the tools are not working properly or they work partially. Like they were able to download single tracks but doesn’t download playlists. So you need to go to some other downloader that does them both. Here we would like to present you the best SoundCloud downloader rated by many of our customers as the best downloader of the year. Let us help you to download the SoundCloud tracks or playlist using the simple web app singlemango. Shall we begin? SingleMango.com is a SoundCloud downloader website that gives you complete ways to download whatever the songs that you need from the SoundCloud. You can easily download single tracks and also the entire playlists. What’s the best part? You can download songs with the song names. Other downloaders will name your songs as 0001,0002,0003 and so on. That makes no sense and difficult to identify the song you need to play when there are many numbered songs in the same folder. SingleMango names you mp3 with song name so that it will be easy for you to select the play the song next time. Like the other downloaders downloading a single track is easy because all you need is to get/copy the URL of the song that is available in the browser and paste it in the textbox that is in the home of the singlemango site. After pasting just hit the download button on the right. Now it will redirect you into the download page where you will have a download button contains your download link. Just hit the button and the song will get downloaded in mp3 format. The good news is that it will get downloaded and renamed. You will also have the album art available there. If you are a lover of the understanding by pictures then take a look at the below pictures and follow the steps. This is the tricky part. Most of the downloaders that are available so far are best only in downloading single tracks that too without giving you mp3s renamed. No downloader provides you with the complete playlist download. In singlemango, we have separate downloader for a playlist and you can check that out here. Now follow the below steps to get your complete playlist downloaded in seconds. Get your playlist link from the soundcloud.com website or if you have already stored it somewhere then that’s great. Go to this link. Then paste the link in the textbox and click download. Follow the images if you need. Within 3-4 seconds boom. You will get your complete playlist download links. Awesome isn’t it. And the tool is absolutely free and will be free for the lifetime. Now let me give you the answer for some of the most frequently asked questions. Where can I see my downloaded SoundCloud songs? It purely depends on the type of browser that you are using. Every browser has a configured download path and that’s where the songs get downloaded. Can I use this tool from my mobile phone to download songs ? Yes of course. This tool is compatible with all the latest android mobile. As you know iPhones don’t allow external files to be downloaded in the phone it is nearly not possible to use it in jnon-jailbreaked iPhones. Am I able to download entire playlist in one shot ? Yes of course. All kinds of playlist with unlimited number of songs can be downloaded in a second. Of course with the name on it. Yes it’s legal. Only when you use it to download the songs that you have the right to download and use it. Otherwise download songs and use it for personal use only. Do you store any kinds of user data in any format? What should I do if the tool isn’t working? There is only 0.001% for this tool to not work. But still if you find this tool not working then you have the right to ask us to fix this tool. We are always online and waiting for your feedback and complaints. Notable features of the SingleMango is that you can download SoundCloud songs in both 128 and 320 Kbps format. All songs that you download will have their name as the file name which is really a cool feature. Fastest According to users comments and feedbacks. Glad that you have learnt how to download SoundCloud songs easy and fast. Just comment below if you have any doubts regarding this. We are happy to help you. Are you a JIO user? Do you want to set your favorite song as your caller tune for free? Then you are at the right place. In this article, I am going to explain you about how to set any song as JioTune caller tune for your Jio number for free. Scroll down for the detailed article. I will explain the step by step process to activate Jio caller tune through the message service. Go to the message app, and type “JT” (JIO tunes) (without quotes). See the below image for clarity. Make sure you type the Captial letters. Now, send the message to ‘56789‘ number. Once you send the message you will get a reply from the JIO care. See the below image for the information. Now it will ask you to choose the song you want to set as your Jio caller tune. If you want to select the song from Bollywood category, then reply back to the same message by typing the number ‘1‘. If you want to select the song from the Regional category, then reply back to the same message by typing the number ‘2‘. If you want to select the song from International category, then reply back to the same message by typing the number ‘3‘. If you want a specific song then reply back to the same message with the first 3 words of the song. If you want to select a song from the particular movie then reply back to the same message by typing, MOVIE <Movie Name>. If you want to set a song from any Album then reply back to the same message by typing, ALBUM <Album Name>. If you want to activate a song of any singer then reply back to the same message by typing, SINGER <Singer Name>. If you want to set Bollywood song as your Jio caller tune, then you have to follow these steps. Once you sent message ‘JT’ to 56789 number, you will get a reply as shown in the above image. There reply by typing number ‘1’ and sent to 56789. Now, it will ask you to select the option to activate the caller tune. Song of the day is nothing but the popular song on that particular day. Top 10 songs are nothing but the best hit songs. Popular songs are nothing but the songs which are popular in the recent times. If the song that you want is not on those lists, then try with the first 3 words of the song or other methods. Here, I have selected the option number 3 and the reply is this. From these options, you can select the song to activate as your caller tune. If you want to set a Regional song as your Jio caller tune for free, then you have to follow these steps. Once you sent message ‘JT’ to 56789 number, you will get a reply as shown in the above image. There reply by typing number ‘2’ and sent to 56789. Select an option that you want and reply back to the same message by typing any number. For example, if you select option number 3 Telugu, then it will show you all the regional songs that are present in that particular language. You can select any song that you want and activate it as your Jio caller tune for your number by replying back to the same message. International songs are nothing but the English songs. Once you select this option, it will ask to select the song to activate it as a caller tune. All you need to do is to follow the instructions correctly. To select your favorite song based on the Movie name, follow the steps below. Send an SMS to 56789 in this format. MOVIE <Movie Name> and send to 56789 number. You will get a reply with all the songs that are present in that particular movie. Now, you can select the song from this movie and set as a caller tune for your jio number by replying back to the same message with your required option number. You can also search for JioTunes based on your favorite song album. It is almost similar to searching based on Movie name, with a slight change in the SMS format. To select your favorite song based on the Album name, follow the steps below. ALBUM <Album Name> and send to 56789 number. Jio also gave you an option to search for JioTunes based on your favorite singer name. To select your favorite song based on the SINGER name, follow the steps below. SINGER <Singer Name> and send to 56789 number. Once your selection of song is completed, reply back to the same message with that particular option number. You will get a confirmation message as shown in the below image. In the above image, it is shown as “we have received your request to set up Closer as your JioTune. To set this as a tune for All Callers, please reply to the message received from <56767XXXX> with Y”. This message says that, if you want to set that particular (your favorite) song as JioTune caller tune for all the callers who call to your Jio number or you want to select it to particular numbers. If you want to set this caller tune for all the members who call to this Jio tune, reply with ‘Y’ to another message you that you receive from ‘5676-70040’. You have requested for activation of JioTunes service. To confirm please reply Y to this message within 30 minutes. That’s it. You are done with the process. Your favorite song is activated as your JIO caller tune. Try calling from another mobile to your Jio number to listen to the caller tune. This service is totally free from the Jio network. Activating JioTunes caller tune through JioMusic app is much easier than the Message service method. The first thing you need to do is to install the JioMusic app on your Android smartphone or iOS device. Open the JioMusic app and search for any song of your choice which you want to set as JioTunes caller tune. Open the song playing screen, there you can see the option “Set as JioTune”. Click on the option and your JioTune will be set. Isn’t it easy? Easy right. Then what are you waiting for? Download the JioMusic app and set JioTune for your Jio number for free. If one of your friends has some caller tune and you want to it to your mobile phone, you can either follow the above methods or you can simply press ‘*’ (star) on your mobile phone. Then reply with ‘Y’ to confirm the subscription. You will get the JioTunes Activation Message or SMS. How to change the Jio caller tune? Changing the JioTune caller tune to a new song is very simple and easy. You can change your Jio caller tune any number of times. You can follow any of the methods I have explained either through message service or JioMusic app. Your old caller tune will be replaced with the new one that you have activated. This is also done for free of cost. This is amazing right. No need to call customer care and ask them to set it. Everything is in your hands. So, just search and activate it. How to deactivate or unsubscribe from JioTune service? I think many of them may not use this option, but for the few who are looking to deactivate your JioTune caller tune service. Here is the process. JioTune setup is very easy and also deactivating it is also very easy. You will receive a confirmation message on your Jio number as the JioTune deactivate service request is received. Another method is to call 155223 and select the IVR option to deactivate your Caller Tunes service. The JioTunes subscription is for 30 days. Once the 30 days are completed the JioTunes service will be renewed automatically for another 30 days and it is free of cost. At present, the JioTunes is for free and we cannot say till which date it is free. We have to wait and see what will happen next. Here is a simple infographic on JioTunes caller setup for free. So this is all about how to set a JioTune caller tune for your Jio number for free. If you have any queries while following the above methods, let me know in the below comments. I will answer all your questions as soon as possible. If you have any other suggestions regarding the JioTunes, write down in the below comments. Which method do you prefer to set a song as Jio caller tune? The typefaces are an important part of the visual impact in any branch of graphic design. If you have seen a typeface that you would like to integrate into your designs, but you do not know how to identify it, do not worry. In this article, we will show you how to identify any typeface and font. Here we will see all the procedures to identify the typeface and the font. The typefaces or fonts used in a design are one of the key pieces for the design, in general, to be successful, becoming directly related to a certain brand or product. That is why it is so important to choose the right type of letter in each design. It is practically impossible to know all the typographies since among the different families there are only negligible details in certain letters, but they are what make the difference between them and make a design work or not. There are several ways to identify fonts and here we are going to show you the two simplest forms so you can find the right type of font for your design. One of the most instinctive methods is to take a picture or screenshot of the text where the design appears and upload it to a web page to help us identify the typeface, or at least get as close as possible to the typeface we are looking for. For this, it is essential to have a screenshot or photo in which the text appears clearly. 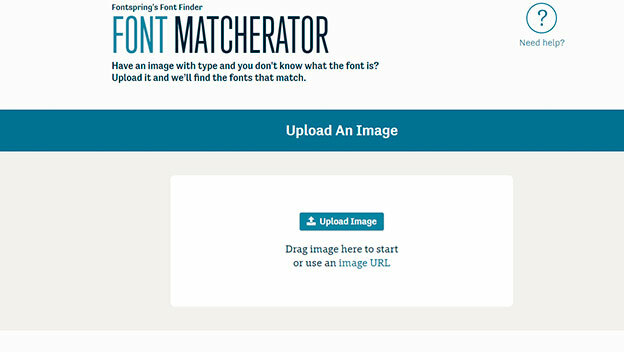 Once you have your photo with the typography sample, access Font Matcherator. 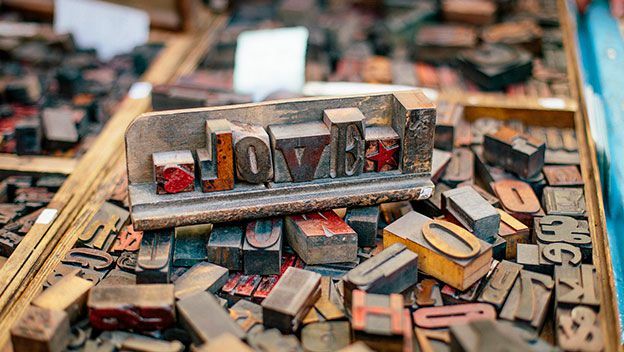 This online service analyzes the image of the text and, based on the details and characteristics of each letter, makes an annotation by families of typographies to which the text you have uploaded may belong. On this page, click on the Upload Image button or drag the photo directly to the box where the button is located. Next, adjust the recognition frame to fit only the typeface you want to identify. Check the Show Glyph Boxes box to make sure that the service is correctly detecting each letter of the text. Then, click on the button Matcherate it! and the service will begin to analyze the text and compare it with its database of sources. Just below the photo will appear the list of fonts that, by coincidence in the curves and forms of the typography, can coincide with the text of the photo that you have uploaded. As you go down to review the photos, a box with the text of the photo that you have uploaded will accompany you standing next to the different types so that you can compare the similarity between them. When you have found the one that most resembles the font you have uploaded, click on it and you will access its details page from where you can buy it or download it directly if the selected font is free. Web design is one of the methods that most use the visual support of typefaces since the text is usually one of the most important elements in this type of content. For this reason, you may be interested in having a tool that allows you to identify the typeface of a website by just clicking on it. For this, it will be enough to use the WhatFont Tool in your browser. Go to the How to use it? Section and click on the Bookmarklet option. 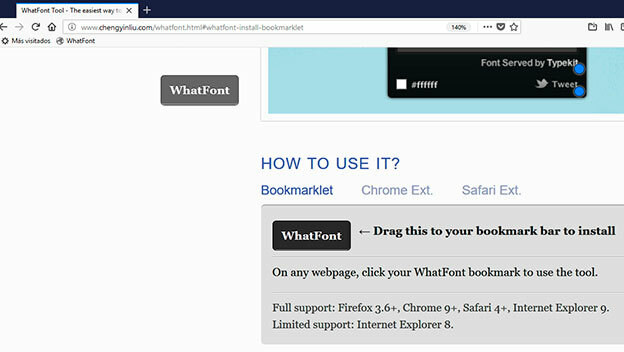 Now, click on the WhatFont button that appears in the grey box and drag it to your browser’s bookmarks bar. This button will be added as its one more marker, but in reality, its behaviour will be different. Next, visit the website where you have seen the typeface you like. Click on the WhatFont marker that you just created and a script will run that will reload the page and activate the type recognition system. Click on a piece of text and a box with all the information about that type will appear. Name, family, line spacing and even the colour that has been used. When you have all the data you need, just click on the Exit WhatFont button that has appeared in the upper right corner of the page. Since WhatsFont executes a script to recognize the font, some browsers can block its execution, so you’ll have to allow it to be executed by hand. For example, in Chrome, you must run the script and an alert icon will immediately appear in the address bar indicating that you are trying to run a script. Click on that icon and to open the options box and click on the link Upload non-secure scripts. Then, the box will be closed and the page will be updated. Press the WhatFont marker again and, now, it will run correctly and allow you to recognize the typography of that web. This is how we are able to find the name of the Typeface and the font from any website or from any image. This is simple, isn’t it? I hope this article will help you now to identify the typeface and the font immediately. If you are facing any issues while processing the above methods, let us know them in the below comment box and we will get back to you as soon as possible to solve all your issues. Did you ever try any of these methods to identify the Typeface and Font? In one way or another, spam always seems to end up coming to our inbox, no matter how little we use the account and how careful we are. Where do spammers get our email? Is there any way to protect our email? The spam email is a common evil in most of our inboxes, either it is Gmail or Outlook or other. That is, spammers are experts in finding us. But, how do they get those? How can we know? What can we do? This article gives you all the answers to all the questions you have. Just continue reading. Knowing how spammers get our Email ID is used to protect us from them. Of course, sometimes it does not depend on us and our way of navigating, so it is difficult to block all those annoying emails completely. Next, we will see how actually these spammers are trying to get our personal Email ID. Be careful where you reveal your Email ID. Spammers sometimes track comments or posts that mention an email account and collect them. Giving an Email ID means you are giving your personal information to them. They will have a lot of ways to know who you are with just your Email ID as Internet has a lot of tools and sources. So it’s better to use a fake ID in public places, until and unless it is important to use your personal ID. Fake ID is nothing but it does not contain any of your personal details. While your personal ID does. When we receive an unwanted Email many times we click on a link to unsubscribe for example; This is fine when it is a trustworthy company, but if the mail looks suspicious it is important that you do not access that link. 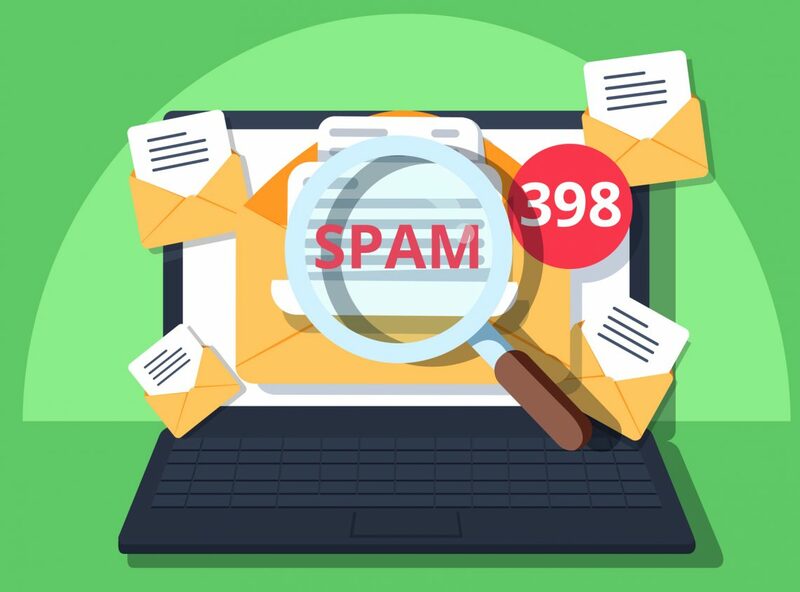 The only thing that will cause is that the company notes that your email account is active and then they will send more and more spam emails to your active account. The same goes for photos: Uploading image is equivalent to loading more spam. Be aware before clicking on any link or a photo because sometimes it leads to hacking. Few people mess with the personal data of other people. Spammers sometimes buy email lists and save all the data; they even sometimes exchange information with each other. Many large companies have been victims of data leaks, from Adobe and LinkedIn to Yahoo and Sony. Spammers get access to the clients’ account, their names and their e-mail, data that they include in a list to send all that unwanted mail. This method is the most common and is quite moving the rest, which already occurs less frequently. There is nothing much you can do to protect yourself besides choosing a good password and try not to use it for several email accounts. Do not give your Email ID in public places (Shopping malls, Internet Cafe, etc). Always use an incognito mode to save your privacy, because when you login via normal mode, there is a chance of saving your password though you have logged out from your account. Never ever access public free Wi-Fi, it is very dangerous where they can easily hack your personal details (Railway Stations, Cafes, etc). Always keep strong Passwords to your Email ID. Keep changing your password and increase more security. Enable 2-step verification so that if any other person is trying to access your Email Account, you will be receiving an OTP to your mobile number. These are the common security tips we should always keep in our mind to protect our data and security. I hope this article will help you to protect your Email ID’s and your personal data from the spammers. If you have any queries regarding the above explanation, let us know them in the below comment box and we will get back to you as soon as possible to solve all your queries. Do you know any other security tips to protect our personal ID and data from spammers? Share them with us in the comment box. So far, there are two usual preferred DNS for the majority of the users. They are Google DNS and OpenDNS. Now, there will be three if Cloudflare fulfils what it promises with its new free DNS service. IT works with IP 1.1.1.1 and 1.0.0.1 and it claims to be “the fastest and most private internet services for the internet for consumers”, that’s why we are going to explain how to use them. The domain name system or DNS, by its acronym in English, is something that all Internet users use. Although there are those who do not know what they are or what they are for. Simply explaining them, their main function is to translate legible addresses, such as www.alltop9.com, to IP addresses, those in which the servers that contain the web are located. Most telephone operators have their own DNS and their operation depends on servers in any of the cases, but they do not always work in the best way. Hence, alternatives that claim to be faster and private arise resolving those addresses and leading to the requested websites. Like those of Google DNS and OpenDNS at the time, or Cloudflare now. Cloudflare ensures that it will erase DNS query records at 24 hours. Cloudflare’s DNS solution, in particular, announces to erase all query records at 24 hours, so it would not record where users browse and exceed response speeds. According to some performance tests, 1.1.1.1 and 1.0.0.1 respond on average in 14.2 milliseconds, while OpenDNS does it in 20.64 milliseconds and Google in 34.51. Other measurements would confirm the leadership. Using 1.1.1.1, the Cloudflare DNS is quite simple since in most operating systems making the change of the domain name system is a very simple task. Now we will explain it below. Problems can only arise with your operator, as it is happening with this new service to Vodafone customers, prevents it for any reason. Although the alternative IP address 1.0.0.1 can be used. We must access the system configuration, the Networks and Internet section, the Status section and the option Change adapter options. Once in the window is opened, we will see the available network connections and we have to give a right click on the active one and select Properties. In the new window, we must modify the Internet Protocol version 4 (TCP / IPv4) element by selecting it and clicking on the Properties button. 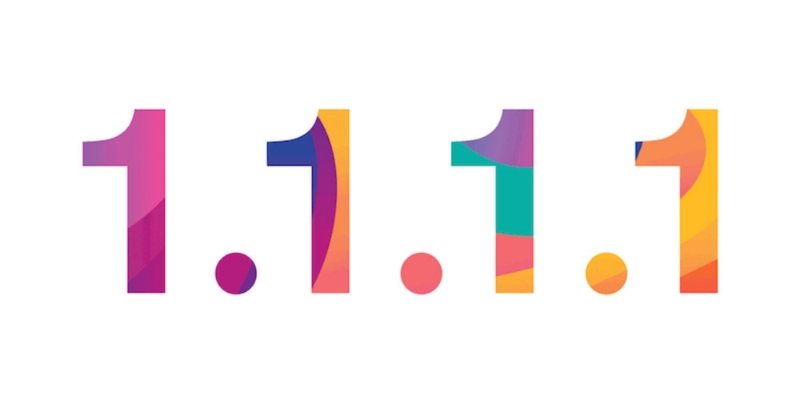 In this other window, we will indicate that we want to use a particular DNS server address, introducing 1.1.1.1 and 1.0.0.1 in the preferred and alternative DNS server fields. In the Apple menu, select System Preferences and then Network. Here we choose the interface used to connect to the Internet, Ethernet or Wi-Fi, click on the Advanced button and click on the DNS tab. In the DNS Servers section of the window that has opened, click on the + (Add) button and enter the Cloudflare DNS. As a general rule, we have to click on the network icon or look for the options related to it and choose the option Edit connections. In the new window, we will choose our current network and click on the Edit button to go to the IPv4 Settings tab. In the DNS Servers field, we will introduce 1.1.1.1 and 1.0.0.1. Go to the Settings section of Wi-Fi connections and keep pressed on the network to which you are connected. In the drop-down that will appear, select Modify network, in the window click on Advanced options and now look for IP settings. Display the menu from the arrow on the right, click on static IP and in the configuration options it will be displayed, scroll to the end and fill them with the DNS 1 and 2 Cloudflare IP’s. Access Settings, in the wifi section and the connected network, click on the information icon. Now go to Configure DNS > Manual > Add service. Enter the Cloudflare DNS IPs and click on Save. Ready. If a section with an IP for the DNS has appeared directly to you, edit it with the desired address. You can also change the DNS you use through the router, in this way the change will affect all the devices that you have connected to the network you create. To change them you have to enter the router through the web browser, usually typing the addresses 192.168.1.1, 192.168.2.1 or 192.168.0.1, identify and go to the section of the local area network or LAN to modify the values of the DNS that appear by Cloudflare, in this case. This is how we can connect the new Cloudflare DNS 1.1.1.1 and 1.0.0.1 in our devices to get the fastest experience as it claims to be. If you have any queries regarding the above methods, write them in the below comment box and we will get back to you as soon as possible to solve all your queries. Did you try this new Cloudflare DNS? Share your experiences in the below comments box.